We all know it, right? Well, ya just gotta have it. 2112 finally showed Rush out on their own, doing their own thing, and doing it well, IMHO. Apple's iPhone Software 3.0 update will be loaded with great new features, but charging to re-download applications may not leave a smile on user faces. Apparently the beta version of the software update adds a dialog that warns users they will be charged full price for applications they download on their iPhone even if the app was previously downloaded. The dialog appears when users attempt to download an application via Wi-Fi, 3G or EDGE. Applications users re-download via iTunes on their computer won't be subject to the extra charge, which may be an indication that Apple is concerned about wireless bandwidth usage, or possibly in reaction to users that are trying to work around paying for applications by using other people's iTunes accounts. So far, the dialog is appearing only on iPhone and iPod touch models that have the beta version of iPhone Software 3.0 installed. Apple may be testing the new requirement with its beta software users, and could plan to roll it out to all App Store customers once iPhone Software 3.0 is released. 4 comments from the community. I can sync multiple iPhones and iPods to my iTunes library. 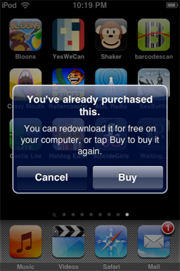 I can also download an app, and then add it to my wife�s iTunes library as well - which she can then sync to her iPhone. Outrageous! My iTunes fails to download/update applications, so I am forced to do it over the air. If I try to reset the iPhone (and thus reconnect to the program) I lose all databases. Prior to this change, I could fix the problem by simply downloading over the air - now I’m scr—ed! Eh, what do you expect from a company that charges for their patches? Another reason to jailbreak!!! I think I have finally had it with Apple. I am going to another carrier the second that hapens.